"Miss, did you know that King Stephen got married one thousand, one hundred and twenty five times?" "Um...I think that website you're reading probably says he got married in 1125." Unfortunately, our bunny Nause passed away last night. We'd had him for about 18 months, I think. He was a real character: bad tempered, cantankerous, an escapologist, a tyrant. He fitted in with us so well. I still remember trying to get him out from under the rosemary with a golf club, only to hear his jaws snap shut around it as he dragged it almost out of my hand. He loved a good chunk of banana and would occasionally nip my finger if it was late coming, or didn't come. We'd just trained him to come to the back door for snacks when he called; I think my favourite thing to watch him eat was parsley, which we'd feed him stem-first. He'd nibble it up like spaghetti until he got to the part where the stalks divided, whereupon it would fall all over the ground. Funny EVERY time. He liked to get out of the garden when possible, and it would be quite a shock to see a pair of ears going across the other side of the fence. He'd stopped doing that lately, though, and was concentrating on being Lord of the Garden. He'd managed to keep the lawn mown (I haven't cut it since June and it's perfectly neat) and the weeds and brambles down around the edges. He developed a habit of running at the mitten and then stopping short, right next to her. She did not enjoy this. In fact, she had started batting him in the face. We are sort of worried they might have fought over the weekend which caused his untimely demise, but I guess we'll never know. From Saturday he was listless and off his food and we didn't think he'd last the night. We gave him water from a dropper and some bunny massage and on Sunday he seemed slightly perkier. By Sunday night he had showed signs of digestion and was eating, but that was his last parsley. He was a bit of a nause when he was hiding under the wood trolley, or hopping back and forth from his favourite spots under the camellia and under the rosemary, avoiding being put back in his penthouse hutch (which he loved after he finally plucked up the courage to use the ramp to change levels, which took months), or thumping late at night when he thought it was probably time for some banana. 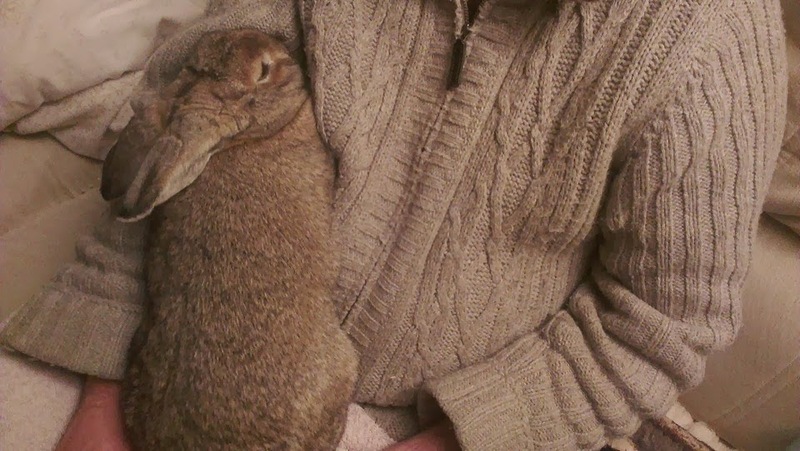 But he was our bunny and I am quite sad that he is gone. Glad he's not in any pain anymore though: he did look quite sorry for himself over the last day or two. Now he's chowing down on the big banana in the sky, with as many cats to chase as he wants. Me: What did we call it when England was divided into seven kingdoms? Y7 student: Oh! OH! IKNOWIKNOW! The hedgy... the hedgy.... THE HEGENOMINY! Me: (recover) YES! The hegemony! But she was able to spell it out correctly. I really love my job particularly a lot when things like this happen. ETA shortly after this it came to me that it wasn't called the hegemony. It was called the heptarchy. I did know this and at the start of the year I was calling it the right thing, but at some point I must have had a crossed wire in the little grey cells. Now I am going to have to come clean with them, after they learned the wrong word so carefully. FOR SHAME. I said it would be keeping me busy for a good two weeks. Mods: I fiddled with the body pattern, unnecessarily - I thought I would not do the shift-on-very-row section but keep it every two rows to make the body a bit longer. Then I had to start the hip increases and realised there was a stonking great cable in the row, so I had to change my plan, only I was lazy and tried to backdate my cable shift by a row, which made it look a bit messy....when will I learn? I think I fixed it so it looks OK, anyway. I also adjusted the sleeves as I was not getting 28 rows to 4 inches, but 24 rows, which is the general ratio for 18 sts/4 inches, from what I can see. There's a comment about this on the Ravelry page; I do think it is a bit odd that the pattern would run with such an unusual gauge. Granted, I was not knitting it in the specified yarn and I didn't wash my swatch (hopefully this will not result in another "When will I learn?" moment upon blocking), but when row gauge is so important for a project, you'd think the designer and technical editors would strive to ensure the gauge is a conventional one. Maybe I am misunderstanding how gauge works. I almost never measure my row gauge, after all. Check me out, experimenting with non-hands-on-hips poses. It is really a joyful piece of knitting. It's a really flattering shape and longer at the back than the front, which I like. The body, including neck ribbing, was off the needles within the two weeks - and considering I didn't join in the round until the second week that was good going; the sleeves took another week, and it was a busy one, so I was pleased. They may need another 3 rows of ribbing, I conceded after wearing it today, but I really should block it first. The yarn has great sproing to it and it's lovely and warm, and not itchy - I wore it with a vest top. The sweater took 6 skeins plus about 5 yards of a 7th - less than 1000m, all told. I was surprised. Two garments finished so far in 2014...maybe I will achieve my target of 12 by the end of the year. Well, not now I've said that, I expect.